January is #NationalSoupMonth – What better way to celebrate than with a collection of the BEST Soup Recipes ever? I have taken the time to compile a collection of the BEST Soup Recipes EVER for you. Right here, all in one place. How cool is that? There is nothing I love more than a piping hot, comforting bowl of soup. I seriously never get tired of it. There are way too many options! How could you get bored? I eat it all year long, even in the heat of the summer. Apparently, most people associate soup with winter though. That’s why they deemed January as National Soup Month. Fine by me! Just another reason to make a pot of soup to celebrate! Am I right? SOME OF THE ITEMS BELOW CONTAIN AFFILIATE LINKS; I AM A PARTICIPANT IN THE AMAZON SERVICES LLC ASSOCIATES PROGRAM, AN AFFILIATE ADVERTISING PROGRAM DESIGNED TO PROVIDE A MEANS FOR US TO EARN FEES BY LINKING TO AMAZON.COM AND AFFILIATED SITES. I AM ALSO AN AFFILIATE FOR OTHER BRANDS. HOWEVER, I ONLY PROMOTE THINGS THAT I LOVE AND THINK YOU WILL LOVE, TOO. FOR MY ENTIRE DISCLOSURE POLICY PLEASE CLICK HERE. I asked some of the best food bloggers out there, to share their favorite soup recipes. The response was amazing! I have taken them and divided them into categories, to help you find them easier. All you need to do is simply click the link to be taken to each recipe! Easy enough? Let’s get started! 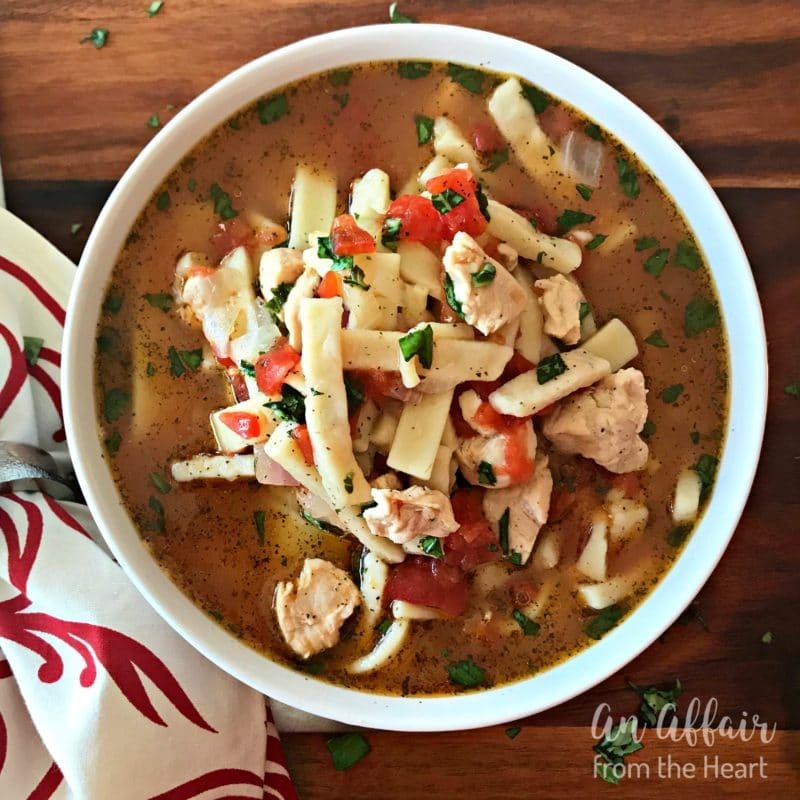 ITALIAN CHICKEN NOODLE SOUP This is an Italian twist on one of my most favorite comfort foods. Italian Chicken Noodle Soup has thick egg noodles, Italian spiced chicken broth, lean chicken, tomatoes and fresh basil. Sure to be a new family favorite! I had to begin our soup sharing with my favorite, Chicken Soup. My Mom’s Homemade Chicken Noodle Soup is by far, my Number One Comfort Food. 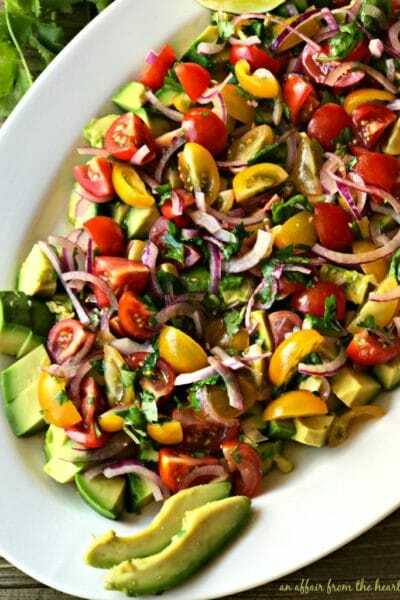 It’s one of the first recipes I blogged. (please excuse the photos – every time I make it, I plan to re-shoot them, but I just decide to eat it instead!! LOL) I have a couple of interesting twists on Chicken Noodle Soup here on my blog, and some other ways to enjoy chicken soup. 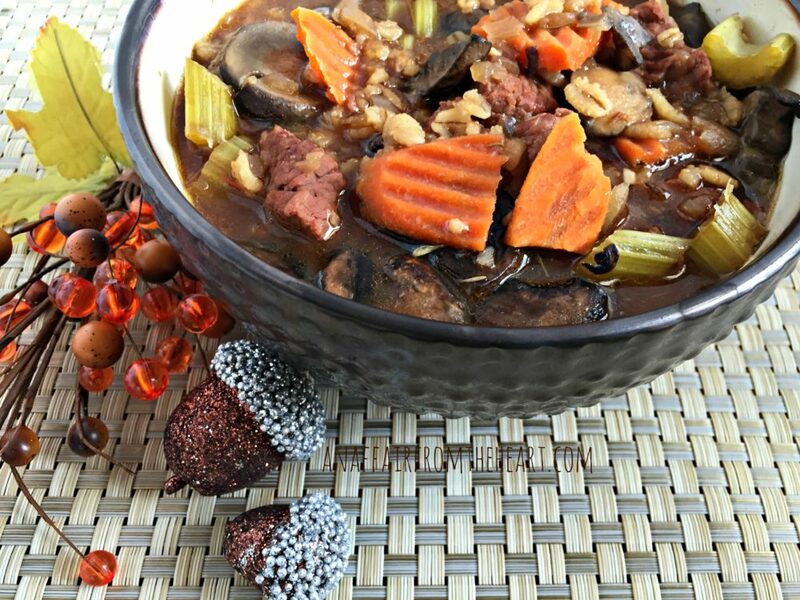 VEGETABLE BEEF, BARLEY AND MUSHROOM SOUP Hearty vegetable beef soup with mushrooms and barley will be sure to fill you up! Next up, that classic warming bowl of vegetable soup. My sister-in-law, Karen, made the very best vegetable beef soup. I asked her once what she put in it, and she went on to tell me that she just tossed stuff in the pot. She took her technique with her, when she passed away in 2005, but to this day, I can’t eat a bowl of vegetable beef soup without thinking of her. My second favorite vegetable soup? My Grandma Czaplewski’s hamburger soup recipe. You’ll find the recipe for it here, too. She didn’t put noodles in hers, but sometimes I do. My favorite canned soup as a kid was Campbell’s Noodles & Ground Beef. They quit making it years ago, but when I add Kluski noodles to her Hamburger Vegetable Soup, it’s as close as I can get! Fun Fact: My recipe for Hamburger Noodle Soup was featured on The Today Show’s food website a couple of years back! 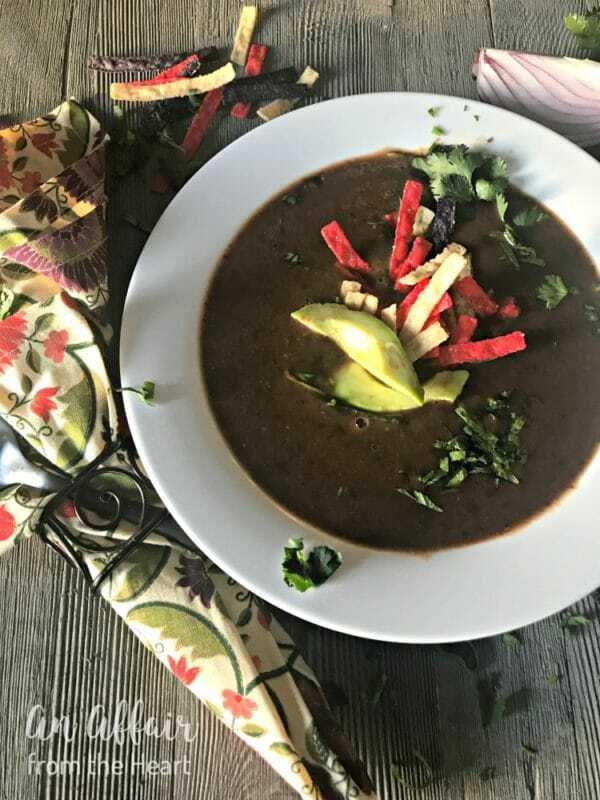 EASY BLACK BEAN SOUP Easily prepared, black bean soup, so rich and creamy and full of goodness. 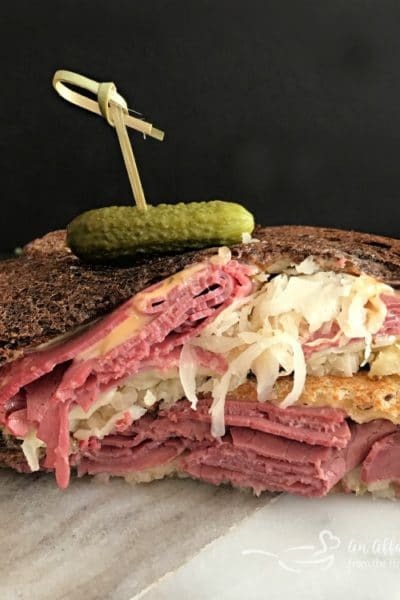 You will be amazed at the magnitude of flavors this one offers! Top it however you like! Growing up Catholic, we typically only ate meatless meals during Lent. (can you say family of Carnivores? ha ha ) . As I have grown up, I love a good meatless meal. Love me some veggies! I wanted to make sure that I had a collection of soups for the vegetarians, and non-carnivores out there, too! 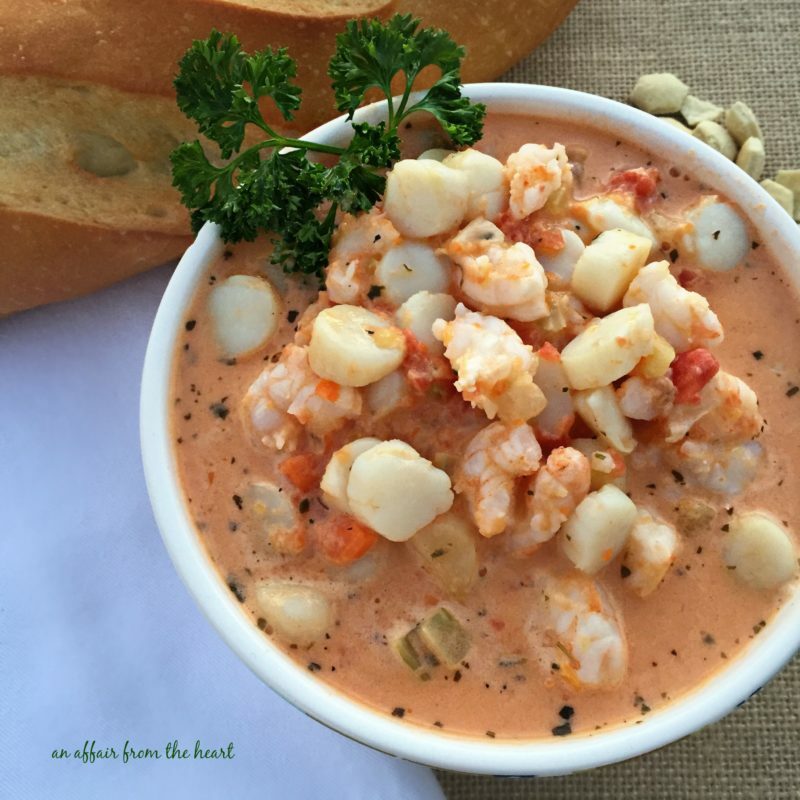 CREAMY TOMATO SEAFOOD BISQUE Shrimp and scallops engulfed in a creamy tomato soup made with veggies, tomatoes and cream cheese. 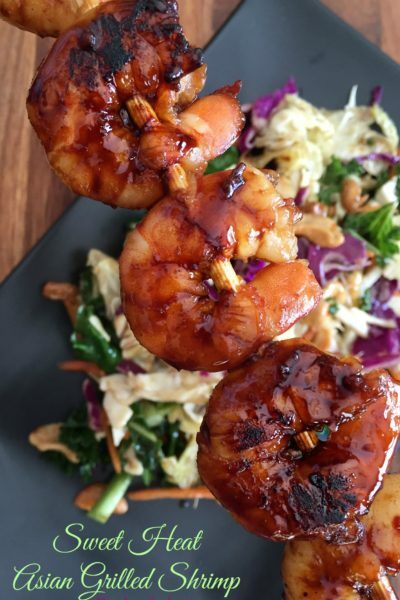 This one is a must make for you seafood lovers out there! 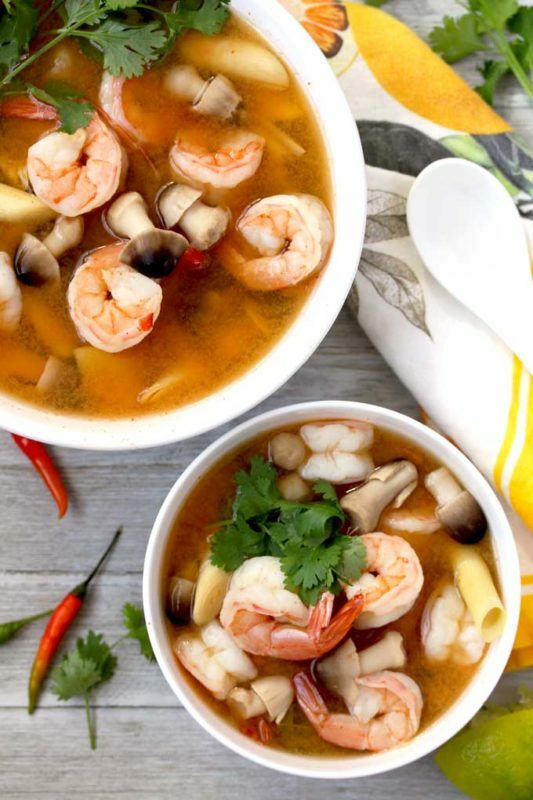 While we are on the subject of meatless soups, how about seafood soups? Can I get a “HECK YEA!!? ?” I love a good bowl of New England Clam Chowder, or a creamy Lobster Bisque. 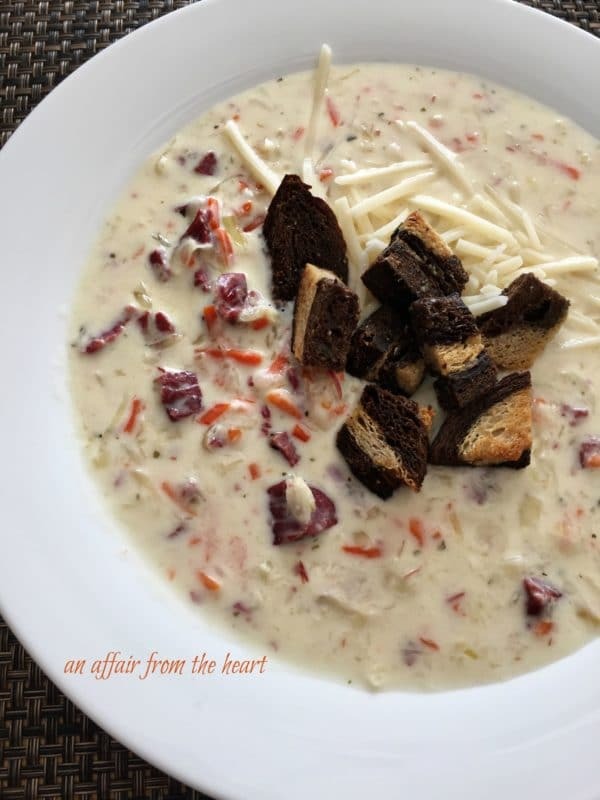 You’ll actually find my recipe for New England Clam Chowder in two sections. This one and the section marked “Instant Pot.” The Lobster Bisque recipe you will find here, belongs to my good friend, Lisa, from Lisa’s Dinnertime Dish. I visited her last October, and she made it for me. It was absolutely SCRUMPTIOUS. 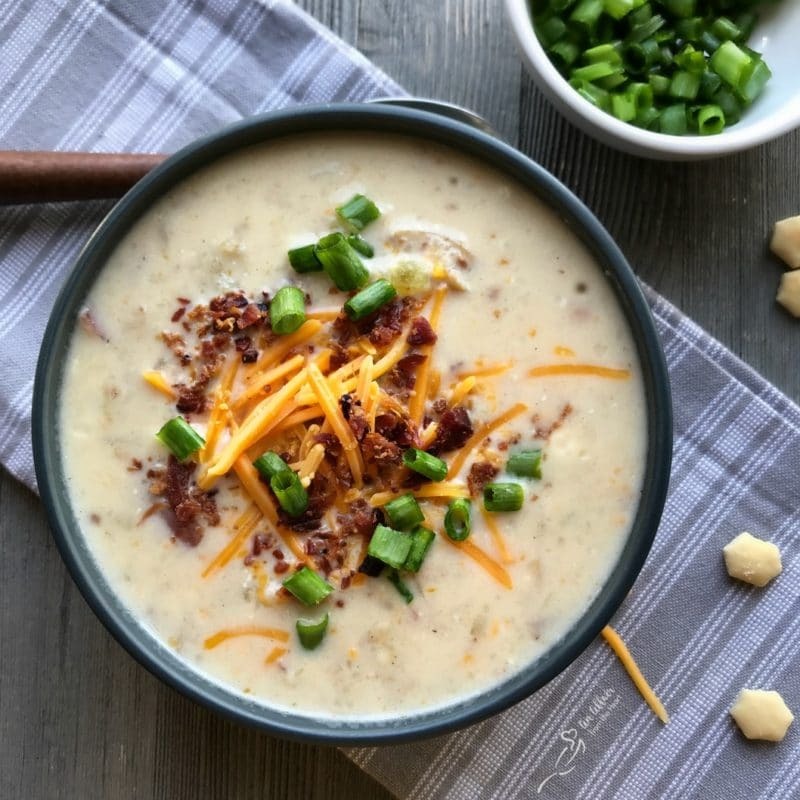 INSTANT POT LOADED POTATO SOUP Instapot Loaded Potato Soup – Made with red and gold baby potatoes, skins left on, instant pot cooked with celery, bacon, cheese. It’s like a warming loaded baked potato in a bowl. As promised, here is the section of Instant Pot or Instapot or Pressure Cooker Soups. Whatever you call them. Do you own an Instant Pot yet? I have had one for about a year now. I have used it a few times, more and more all of the time. My favorite thing to make in it is definitely soup. It makes it super easy, it’s one pot and that’s makes less dishes. #WINNING If you are considering an Instant Pot, I am very happy with mine. I own the Instant Pot Lux — it does all sorts of cool stuff!! It sautés, slow cooks, and even works as a rice maker. 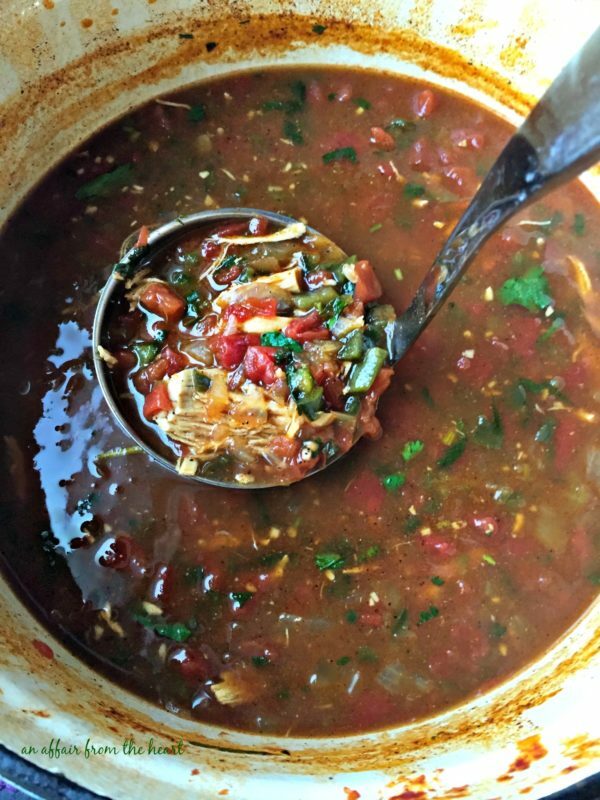 Slightly spicy and full of robust flavor, this Chicken Enchilada Soup is easy to make and will warm you from your head to your toes! Slow cooking soups will never be a thing of the past. No matter how you speed things up or make them easier, there is just something about coming home after a long day to dinner in the crock pot. No fuss, just dish it out and enjoy. When I asked for crock pot soup recipes, everyone had their favorites, and that made this list for you top notch! Slow Cooker Ham & Shredded Potato – Who Needs a Cape? 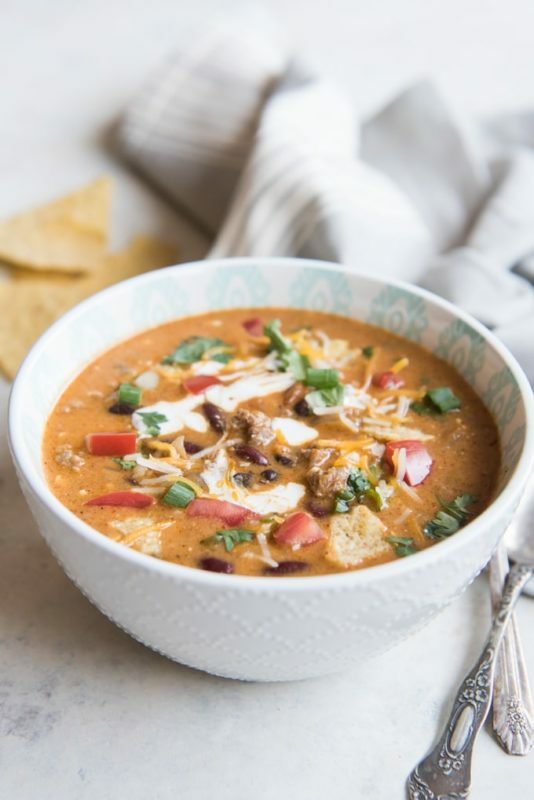 Slow Cooker Turkey Taco Soup – Who Needs a Cape? 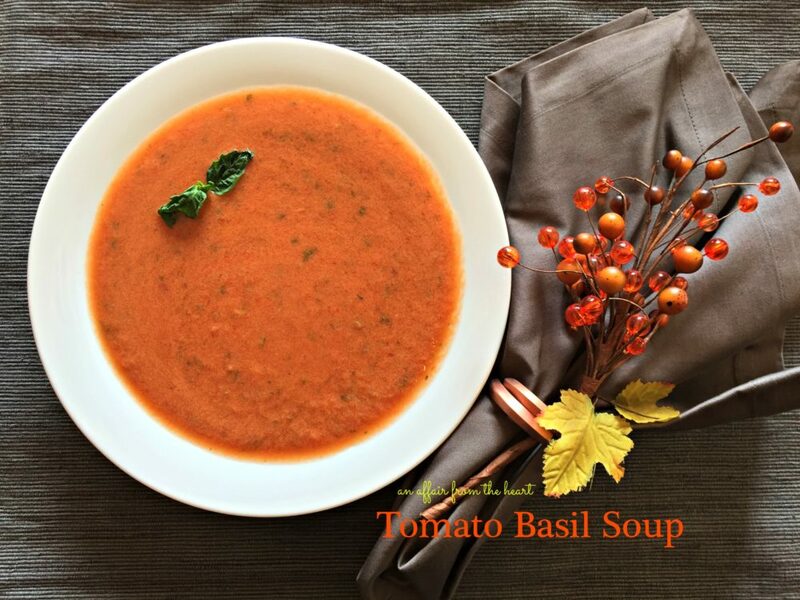 Easy to make, Homemade Tomato Basil Soup. Good year ’round, but it really hits the spot with a nice grilled cheese or a baguette bread on a cold fall or winter’s day! Tomato Soup and Grilled Cheese. That classic combo is one I love and I crave! It totally brings me back to my childhood. On snow days, my Mom would make my brother and I grilled cheese and tomato soup. Typically eaten in between day long games of Monopoly. These days, tomato soup got a lot more grown up. Check out these great options! 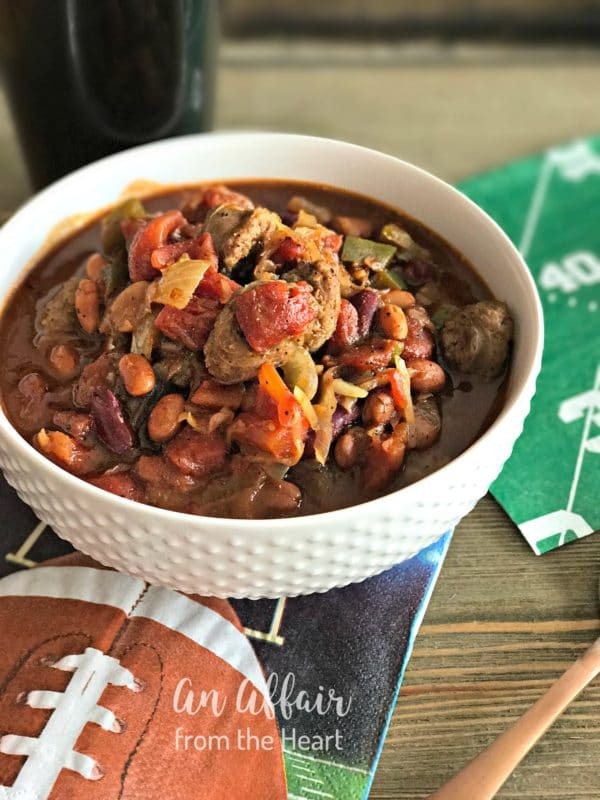 OKTOBERFEST CHILI An Oktoberfest twist on a classic chili – spicy, hearty and flavorful, made with bratwurst and sauerkraut. Chili. There isn’t anything quite like it, and it seems no two people make it the same. Tons of meat, vegetarian, beans, no beans, white chili, spicy chili … The options are endless. Here is a collection of chili recipes that are sure to warm your from the inside out! 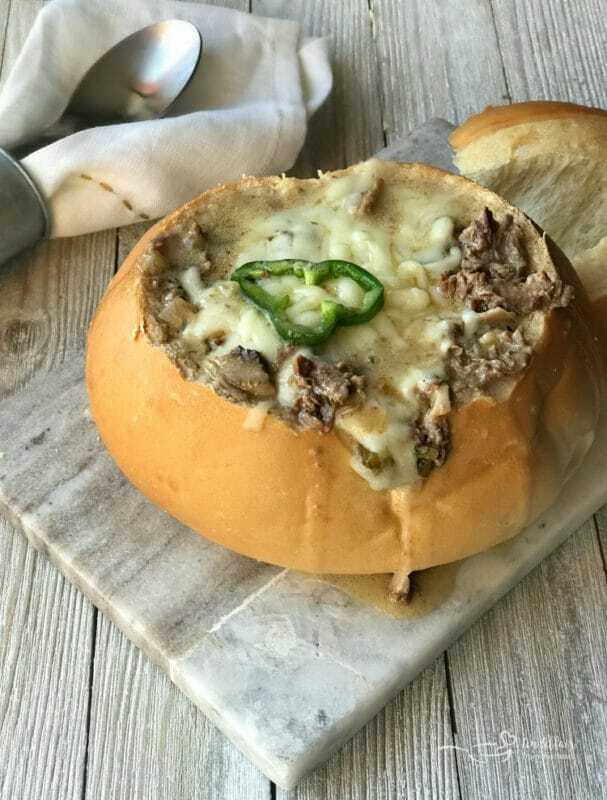 This one pot Philly Cheese Steak Soup is going to be a new family favorite. Take that classic sandwich and serve it up as a rich and creamy soup in a bread bowl. Look at all of that melty cheese! Just because it’s easy, doesn’t have to mean it has to taste like it! In addition to the Instant Pot soup recipes, I have these amazing soups right here that require little work/ingredients, but taste like a million bucks! I mean … LOOK at that Philly Cheese Steak soup up there! I’m in love. 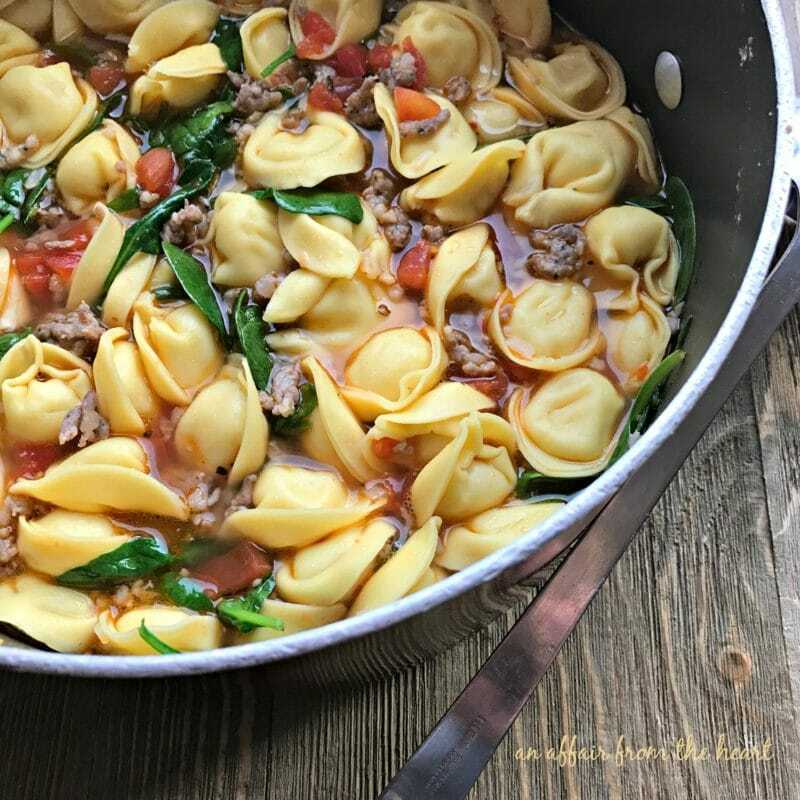 Only 5 Ingredients to this delicious soup made with Italian sausage, tortellini and spinach. If you asked 50% of my family what their favorite food was, they would say Italian. We are a family of pasta lovers, and you can tell by my waistline! (HA!) Combine the comfort of pasta with the comfort of soup and you are sure to make my family smile! How about yours? The other 50% of my family? They would shout “MEXICAN FOOD!” I would be among one of the crowd for sure. I love Mexican cuisine so much!! Put it in a piping hot bowl of soup and I am one happy mama!! When I crave take out Chinese, it’s typically for one reason. Hot & Soup Soup. It’s by far one of my most favorite soups, and I have made it from scratch, but I have yet to blog it. My friend, Kathy, from Lemon Blossoms, has this gorgeous Thai version of hot and sour, that you know I will be trying soon! I have so many soups that I couldn’t possibly share them all, and some of them, that are my favorites, didn’t suite fit into any of the categories I had here. So, I made my OWN category. It’s my website — I can do that! I named it “Just Good Soups” because they are that. They are just plain good. You’ll find them below that will take you to the direct link, here on my blog, for ALL of my soup recipes. Hamburger Soup, with or without Noodles — This recipe was featured on The Today Show Food website. I love it because it’s my Grandma’s Recipe. I sure hope that you have found lots of new soup recipes that you and your family can enjoy for months and months to come. As always, your comments, ratings and shares are appreciated. Tag me in social media, so I can see what you’re eating! Hi, I am Michaela. 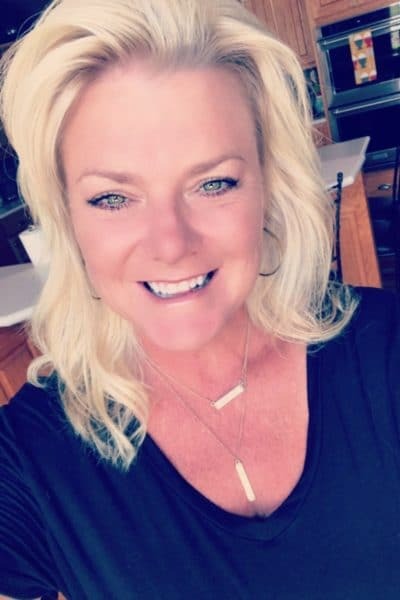 Stay at home Mom of four, married for over two decades to a man I adore, food blogger, dog lover, party thrower, gift giver, wish I were craftier, liver & lover of life. It’s the perfect time for soup! That loaded baked potato looks fantastic. What an amazing collection of soups for this winter season. Definitely a post to be bookmarked. Epic list! I love soup. Ill definitely be holding onto this. So many fabulous and delicious options! I better print some recipes and start cooking! Thanks for sharing! Oh man oh man!! 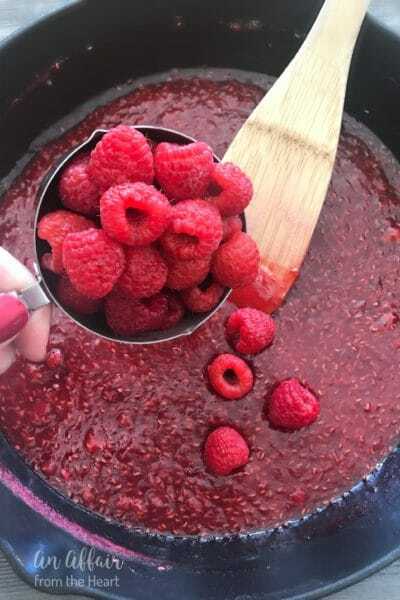 My kind of recipe post!! I love all these soups! All look so delicious and inviting esp the seafood bisque and potato chowder and philly! So want some now! 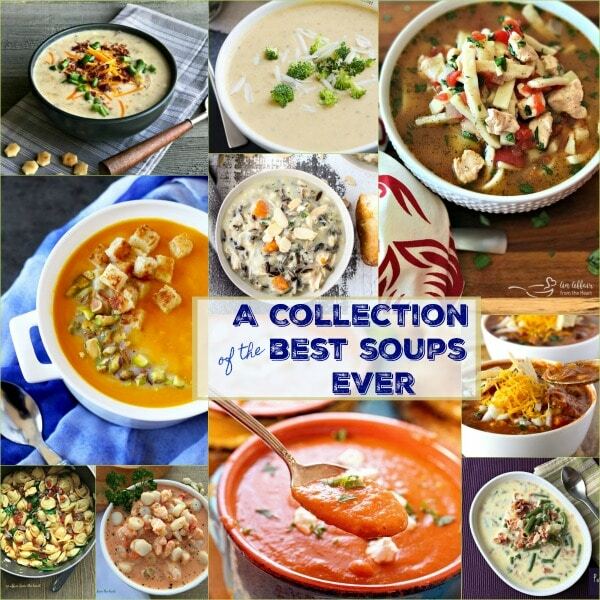 This seriously does look like the best soup collection ever. So many to choose from! So many, many great soups to choose from! I am bookmarking it and referring to it every time I need a soup recipe. Thank you for including my soups in your amazing list. This is my new bible. I can eat soup ear around and am always looking for inspiration, This is an amazing list! I feel a cold coming on, this soup round up came just in time! There are definitely a few there I want to try. You can’t beat a good bowl of soup. What a great collection! I can’t wait to try some of these awesome soups, perfect for this cold winter we’re having! I love soup anytime of year. This is a terrific roundup. Pinning! 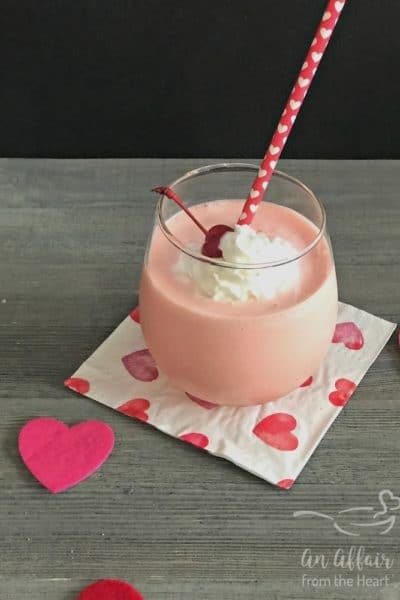 Affiliate Link Disclosure: Some of the links you will see on An Affair from the Heart are affiliate links, meaning that, at no cost to you, I may earn a small commission if you click through and make a purchase.